There were 3 different applications for pyramid patterns this year at Photonics West in San Francisco; improved LED’s, improved absorbers and single quantum dot devices. There were 3 different applications for pyramid patterns this year at Photonics West in San Francisco; improved LED’s, improved absorbers and single quantum dot devices. This not the first time the ancients have come to the rescue of nano-technology, a couple of years ago we had nano-menhirs. Several groups talked about improving LED’s through pyramids. A Samsung team grew GaN pyramids through a pattern of 200 nm holes in silicon dioxide on sapphire. They then formed a multiple quantum well on the faces of the pyramid. Previous groups have shown that GaN quality can be improved by this sort of “lateral overgrowth”. This time the team reported that wavelength of emission could be altered due to both quantum dot effects at the point of the pyramid, and by varying the indium content by changing the pyramid spacing. They showed a nominally blue LED, with green and yellow emission. This would seem a really interesting way to get to improved green LED’s. They are working on getting the current management right. Another Samsung team grew LED emitting GaN pyramids on glass. They put down a underlayer of titanium that formed a polycrystalline layer with consistent crystal orientation. 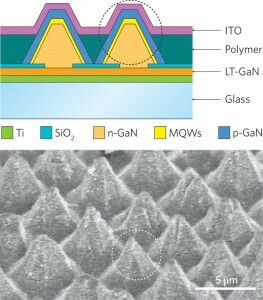 They then patterned a silicon dioxide layer and grew device quality oriented GaN pyramids. They fabricated working devices on the pyramids. They made it clear that this was not commercial device quality yet, however it is a big step forward to make working LED’s on glass, and the prospect of fabricating LED’s in LCD equipment meters on a side. Pyramids of alternating metal/dielectric meta materials were fabricated by Jay Guo’s group at U. Michigan. They used lift off from a lattice photoresist pattern to create isolate pyramids. The combination of a multilayer meta material and graded pyramid geometry resulted in a broad band absorber. All sorts of interesting opportunities come to mind beyond a simple anti-reflecting layer. One further-out thought is to build solar devices around the broad band absorber. Several groups talked about plasmonics to improve thin layer cells, and I will report on these in a week or two. Finally pyramids were used by to make an electronic device based a single quantum dot. The challenge is how to put a dot in a know location so as to make electrical content. A team from NRC Canada grew flat topped pyramids by epitaxy through patterned holes, and the grew a single quantum dot on top of the pyramid. The pyramid defined the dots location so they could pattern contacts. This paper won the best paper award ! It was followed by a particularly riveting paper on wire grid polarizers by yours truly, an implementation of nano-canals perhaps. —Mike Watts has been patterning since 1 um was the critical barrier, in other words for a longtime. I am a tall limey who is failing to develop a Texas accent here in Austin. I have a consulting shingle at www.impattern.com. My blog “ImPattering” will focus on the latest developments in the business and technology of patterning. I am particularly interested in trying to identify how the latest commercial applications evolve. Mike Watts is a contributing writer at Semiconductor Engineering.